The Friday tour will include a dragonfly photography workshop! To attend, register for the Friday tour and you can sign up for the workshop at the meeting. To make cost more flexible, the mid-conference trip will now be an optional Friday local field trip. 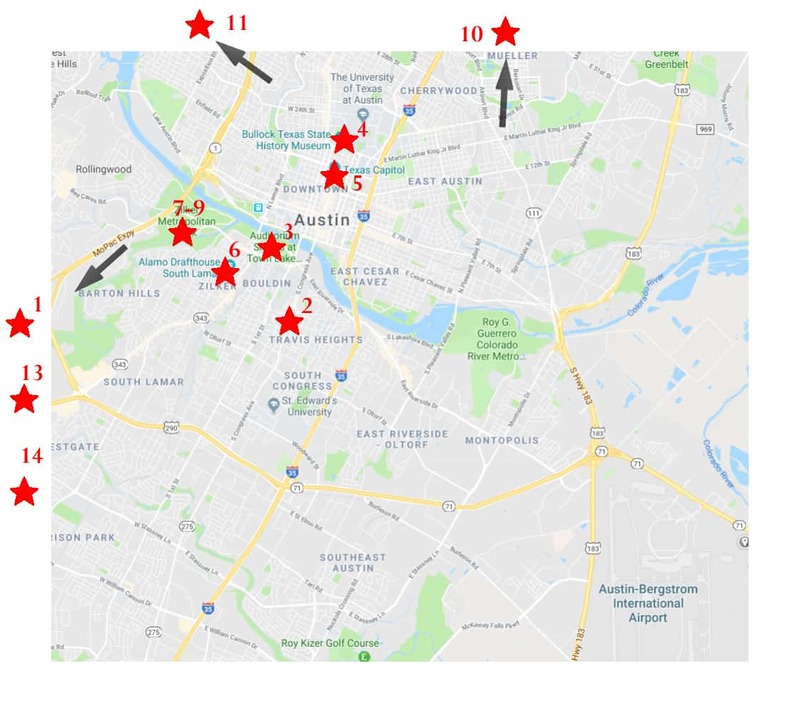 We will take you to some of the hotspots for dragonflies in the Austin area. For the post-congress trip, we’ll travel to the Rio Grande Valley in south Texas to see some of the Neotropical fauna that just makes it into the United States. Click here for more info. 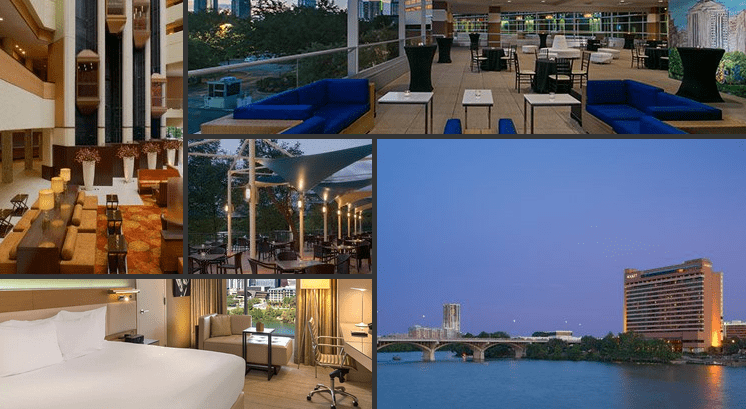 We are hoping to see all of you in Austin, Texas July 14-19th for ICO 2019! Sustainability is extremely important to the city of Austin and the Palmer Events Center. 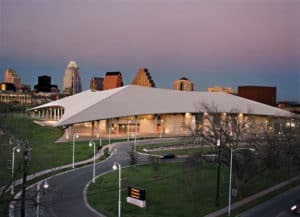 Any client wishing to use the Palmer Events Center for an event can have the utmost confidence in its commitment to being a “green” facility. The logo for ICO 2019 features the American Rubyspot, Hetaerina americana, a common species throughout the mainland United States. 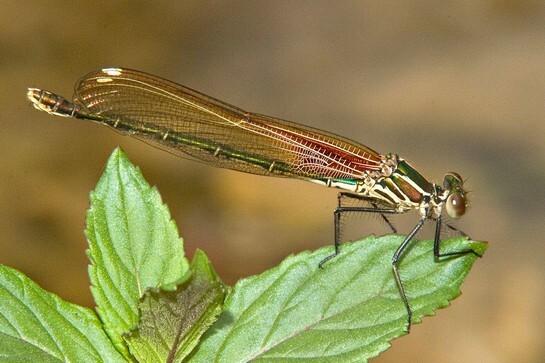 Both males and females of this damselfly species have brilliant metallic iridescent bodies, and males develop crimson patches on the basal fourth (or more) of their wings. 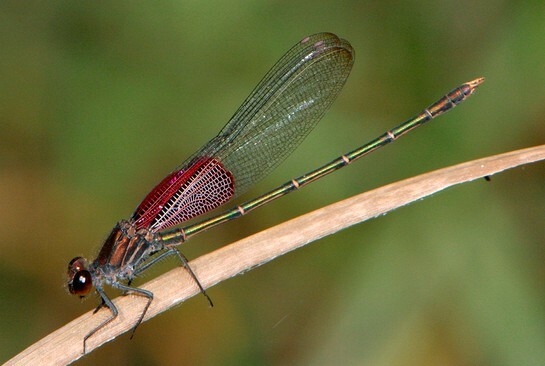 You are sure to be greeted by the American Rubyspot along streams and rivers while you’re in Austin, as well as the Smoky Rubyspot (H. titia), which is also found in these parts. The logo also features the lone star of Texas. You’ll find that among the citizens of the US, Texans are exceptionally (and perhaps inordinately) proud of their state. The lone star is an element of the Texas state flag, which decorates many homes and businesses throughout the state. Once you start looking for it, you’ll never stop seeing it! Featured fonts: Wood Print by Elo Marc (http://www.artshop.elodesigns.com) and White Vinegar by Tom Kolter (http://www.ghostsofbigfoot.com). Photo credits: H. americana male (left): John Abbott; female (right): Greg W Lasley. Online registration is now open! Earlybird registration rates are available until 30 April 2019. Click the REGISTER button (right) for pricing, add-ons and registration. Abstracts for presentations and posters can be submitted online using the button to the right. Presenters, please read the information below before submitting an abstract. Abstracts can be submitted until 30 April 2019. SUBMISSIONS ARE FINAL: Abstracts will be reviewed as they are submitted to speed up the review process, so you will not be able to edit your abstract after submission. Here is a general overview of the ICO2019 program, which is subject to change. A more detailed program will be posted as the Congress approaches. All ICO events will take place on the second floor (pic to right) of Palmer Event Center. It is easier to enter from the north (river side) of the building. You may be asked to help with registration table or help moderate a session! If you have a preference for one of these activities please let us know. We will reply to your email with your letter of invitation within approximately 48 hours. Information about obtaining a visa to the US can be found here. Visas are not required for travel from several countries to the US; the VISA WIZARD on the right of the linked page is helpful for determining which, if any, visa is required. Airport code for Austin, Texas is AUS. A quick 10 minute walk from the Hyatt to the Palmer Event Center. All ICO events will take place on the second floor. It is easiest to enter the Center from the north side or lake (river) facing side of the building. Note: Texas labels many of its highways with 2 or more names. Turn west (left) on Hwy 71 (Ben White Blvd). Stay on this road for 6.6 miles to I-35. Take I-35 north (right) for 1.3 miles until you get to Exit 233 Riverside Dr.
Exit 233 on Riverside Drive and go west (left). Drive through the Congress Ave. intersection and the next light is Barton Springs Rd. 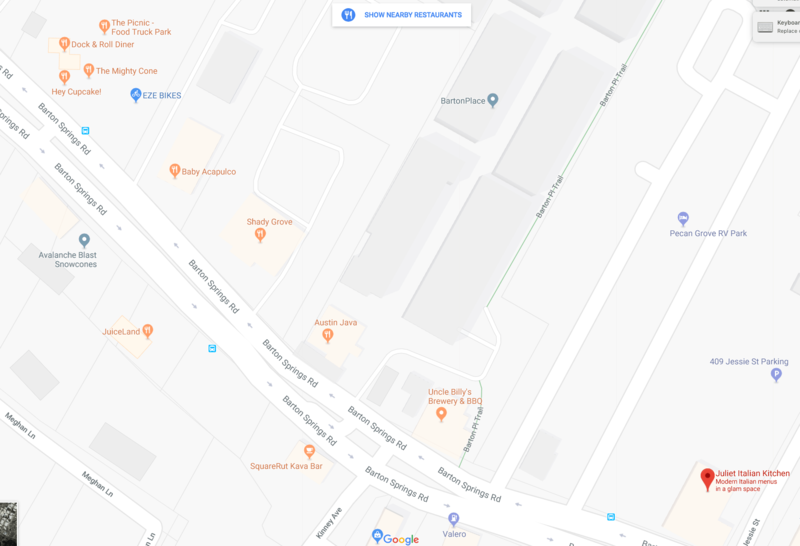 Turn left on Barton Springs Rd. Palmer Event Center is 0.3 miles on the right. Turn south (left) on South 1st Street. Turn west (right) on Barton Springs Road. The Palmer entrance will be on your right side, just past the Palmer marquee. Continue west on Riverside to the traffic circle and turn around to return in the eastbound lane. The Palmer entrance is just past the Long Center on the right side. All ICO events will take place on the 2nd floor of Palmer Event Center. It is easier to enter from the north (river) side of the building. There are several hotels near the Palmer Event Center. The three closest are listed below. The Congress Diner will be a bat tour departing from the Hyatt Regency (lake side). Click here for a group rate. Click here is a list of other places in Austin. Click here for Air B&B. There is a great tour company called Austin Detours that has numerous tours available so please feel free to contact them and hop on a tour! 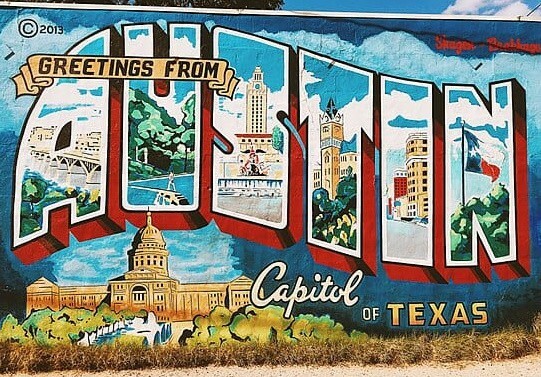 Below is a list of some not-to-be-missed places when visiting Austin. NOTE: When dialing any of these numbers from a hotel phone, you may need to dial 1-512 first, then the 7-digit number. South Congress Cafe has been on several foodie TV shows and has AMAZING calamari (comparable to ICO 2007) and cocktails! The Continental Club is a famous bar with live music. Magnolia Cafe is one of Austin’s 1st choices for a local sit down breakfast. These two trails are connected. 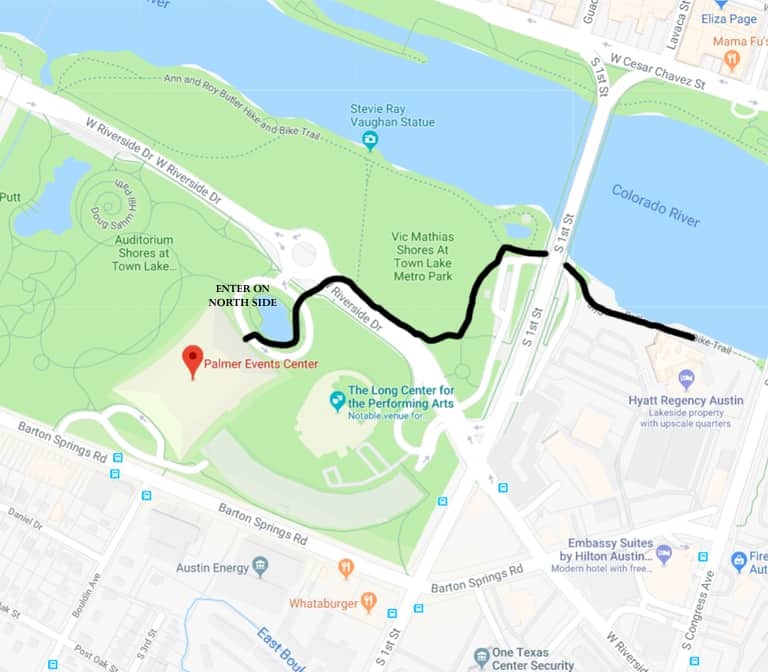 Lady Bird Lake Hike and Bike Trail is the trail around the lake. You can jump on it in front of the Hyatt. This is a 10 mile loop trail that is VERY popular. Lots of nature can be seen from this trail, especially near Barton Springs, even though it is in town. 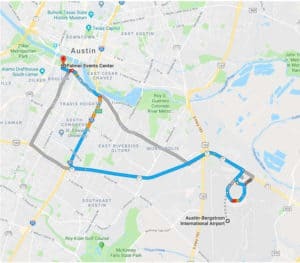 The Austin Green Belt connects with the Lady Bird Lake Hike and Bike trail at Zilker Park. The Green Belt has 12.7 miles of trail. This is a great museum to learn about Texas history and more. An Austin classic where you can enjoy a movie with food and drinks. They have a number of signature series that are a lot of fun. There are 6 theaters in Austin but the closest to the conference is on South Lamar. There are LOTS of steps to get on top of the hill but it is an AMAZING view. This is a 30-min drive from downtown. Fredericksburg is in the Texas Hill country with local shopping, wineries, gift shops and everything and anything Texas in between. This is a 2-hour drive but totally worth it! 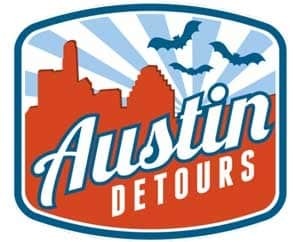 Austin Detours also does a trip her so feel free to contact them. Enchanted Rock State Natural Area is also located just north with a large granite outcropping. There are numerous restaurants to choose from close to the Palmer Event Center. There are 5 places directly across the street. They are posted from least expensive to most expensive. There are TONS of places just up Barton creek Rd. as well; these are also posted below. Arguably the best BBQ in Texas. Certainly one of the best! 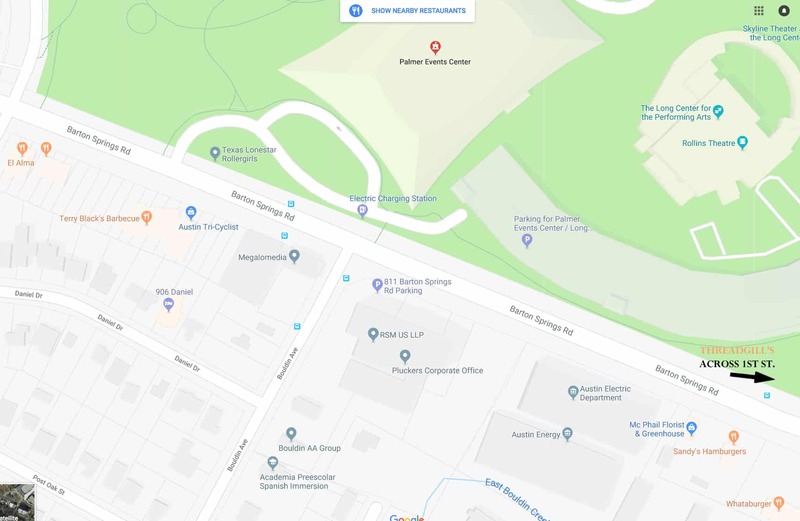 Just a 10 minute walk west of the Palmer Event Center across South Lamar Blvd there are numerous restaurants as well as a food trailer lot. Vegetarian Note: Almost every place in Austin (even BBQ) has veggie options. WARNING however, almost all green beans are made with bacon!! So not vegetarian safe in Texas! 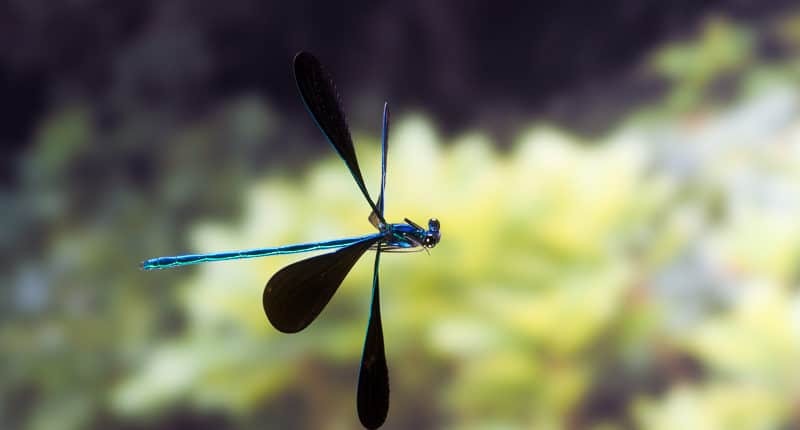 Texas is home to 246 species of dragonflies and damselflies, and there are 117 reported for Travis County (where Austin is located). Here are some helpful resources. 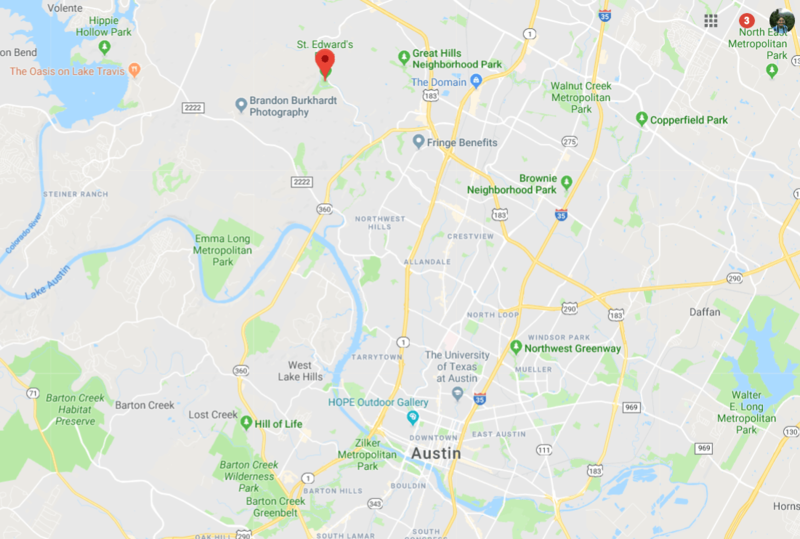 The Palmer Events Center is located at 900 Barton Springs Rd, Austin, TX 78704. All ICO events will take place on the 2nd floor of Palmer Events Center. It is easier to enter from the north (river) side of the building. We will have signs inside to help guide you. 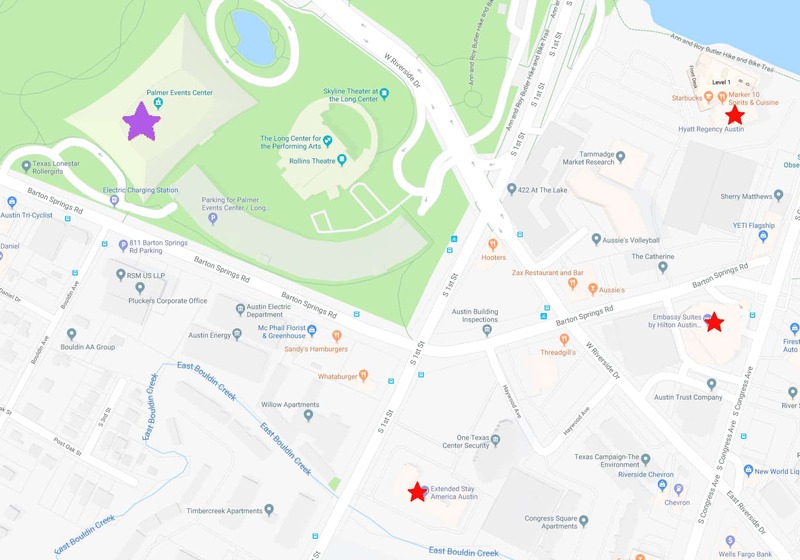 Click here for directions and parking from various locations as well as bus maps. 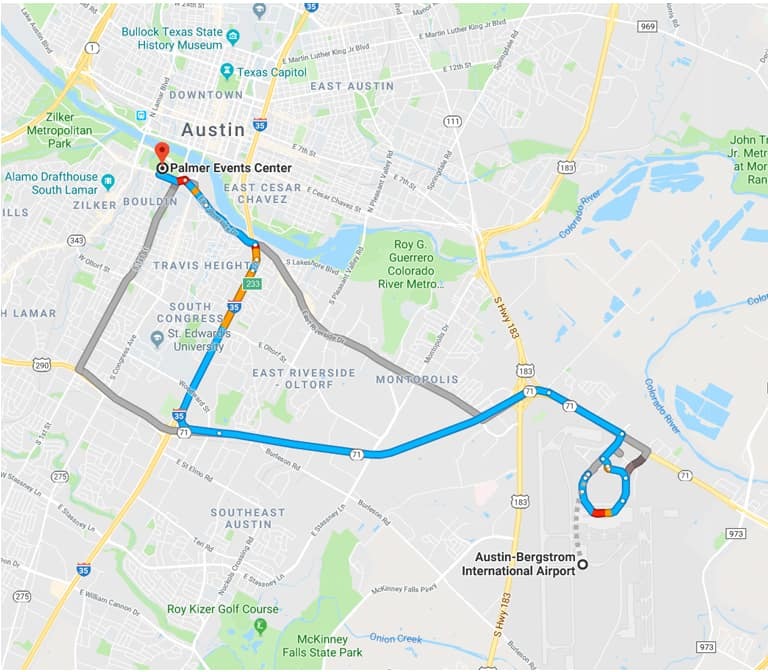 Click here to get the CapMetro (Austin Bus) app.